The rising population known as "s" for its members' lack of religious affiliation is changing American society, politics, and culture. Many s believe in God and even visit places of worship, but they do not identify with a specific faith or belong to a spiritual community. Corinna Nicolaou is a , and in this layered narrative, she describes what it is like for her and thousands of others to live without religion or to be spiritual without committing to a specific faith. 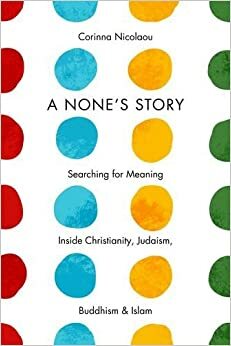 Nicolaou tours America's major traditional religions to see what, if anything, one might lack without God. She moves through Christianity's denominations, learning their tenets and worshiping alongside their followers. She travels to Los Angeles to immerse herself in Judaism, Berkeley to educate herself about Buddhism, and Dallas and Washington, D.C., to familiarize herself with Islam. She explores what light they can shed on the fears and failings of her past, and these encounters prove the significant role religion still plays in modern life. They also exemplify the vibrant relationship between religion and American culture and the enduring value it provides to immigrants and outsiders. Though she remains a devout , Nicolaou's experiences reveal points of contact between the religious and the unaffiliated, suggesting that s may be radically revising the practice of faith in contemporary times.